To commemorate Memorial Day, we choose to highlight American artist John Melville Kelly’s “Hawaiian Soldier,” an absorbing and poignant portrait of a worn soldier from World War II. 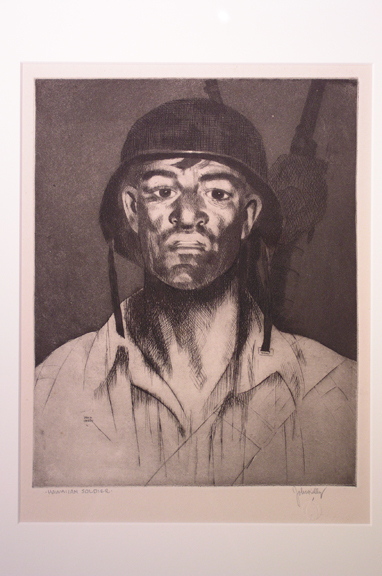 During the war, Kelly—a painter and printmaker who was born in California but spent a large part of his career in Hawai’i—was commissioned by the U.S. military to portray a Hawaiian soldier. “Kelly explored multiple variations of this print, experimenting in sketches with different poses, uniforms, camouflage drapes, and firearms before arriving at the final version,” says Interim Director of Curatorial Affairs and Curator, Arts of Hawai‘i, Oceania, Africa and the Americas Healoha Johnston. …Which the U.S. military allegedly refused to accept. “It is possible that the portrayal of a shell-shocked soldier expressed all too vividly the reality of combat rather than romantic ideals of heroism,” Johnston continues. 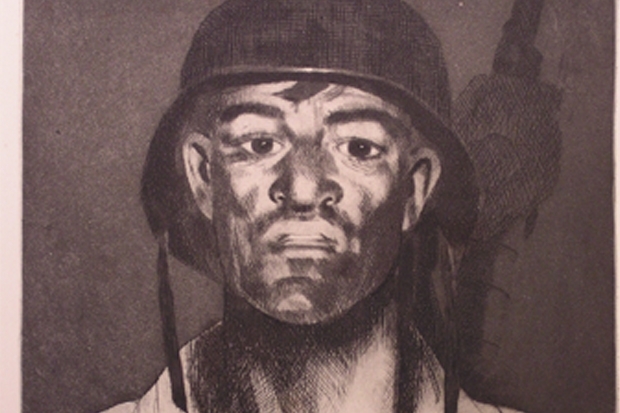 Upon viewing the haunting print, your eyes are instantly drawn to the soldier’s. Kelly manages to evoke feelings of discomfort—seemingly more mental than physical—through the dark and captivating eyes. It’s as though through eye contact, you can understand what the soldier’s been through. It provides a silent moment for viewers to reflect. This etching and aquatint print is currently on view at Spalding House. Interesting, too, that the soldier appears to be non Caucasian.